A CW satirical telenovela, Jane the Virgin stars Gina Rodriguez, Andrea Navedo, Yael Grobglas, Ivonne Coll, Jaime Camil, and Justin Baldoni. Although saving herself for marriage, Jane (Rodriguez) gets pregnant, thanks to accidental artificial insemination, which turns her life upside down. At today’s Upfront presentation in New York, overall, The CW announced/confirmed that the upcoming installments of iZombie, Jane the Virgin, and Crazy Ex-Girlfriend, will be their final seasons. While the iZombie fifth season renewal was just issued during the May 11th pre-Upfronts rush, both Jane the Virgin (season five) and Crazy Ex-Girlfriend (season four) were picked up for their final seasons on April 2nd, when the network renewed the bulk of its shows. What do you think? 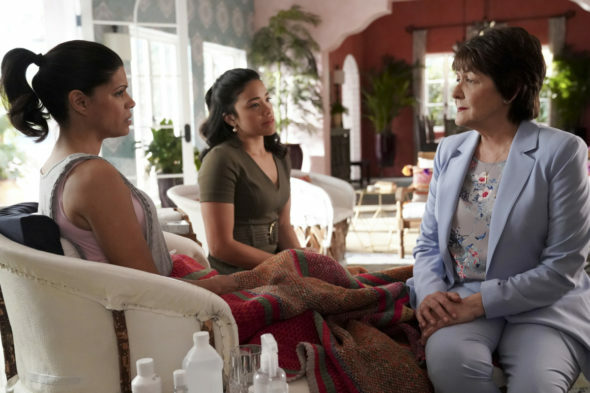 Is the Jane the Virgin TV series ending at the right time? If it were up to you, would The CW cancel or renew it for season six? More about: Crazy Ex-Girlfriend, Crazy Ex-Girlfriend: canceled or renewed?, iZombie, iZombie: canceled or renewed?, Jane the Virgin, Jane the Virgin: canceled or renewed?, Jane the Virgin: ratings, The CW TV shows: canceled or renewed? Jane the Virgin: Will Season Five Be the End for the CW Series? Definately need season 6!!! Please please pleaseeee Season 6 even not enough! I have really enjoyed this show so much I feel like I know the characters. I don’t want it to end, I look forward to seeing if Jane and Raphael will end up together ❤ and maybe have another child or twins or triplets because they find another sample of raphael’s sperm that Petra secretly hid for the future. I really want to see if maybe Petra and Michael end up falling in love and get married and have more children. They can’t cancel it too many people love this show❤❤❤❤. Please more Jane the virgin I absolutely love the show!!!!!! Don’t end it with season 5!!!! PLEASE!!! Renew the show! It’s such a GREAT show!!! I love it and I want to find out how is Michael still alive and what will Jane and Rafael do now!?!? PLEASE!!!! Renew the show! It’s such a GREAT show! I love it and I want to find out how Michael is still alive and what will Jane and Rafael do now!?!? Renew the show! Please! I love it and I want to find out why Michael is still alive and what will Jane and Rafael do now????!!!!! OMG!!! I need to know too. Who leaves there fans hanging like that!! What does it matter what we think, if y’all really cared and took the fans under consideration you wouldn’t leave is hanging!! Need to have a season 6, can’t end the show with the way season 5 ended, need to know how Michael is still alive and what happens and if Solana beats cancer and does wella marry Jorge? To many unanswered questions. There should be a season six of Jane the Virgin for sure! I love this show and it is a bright spot for me to relax and watch this outstanding show! You can’t end it in season 5 because it is a heartbreaking thing to do to all the loyal fans! Are you thinking that season five has already aired? There’s a whole new season ahead. I love jane the virgin if im not able to watch it when it schedule time i take the weekend and catch up. Please dont end it now i have program i schedule my self to watch every week and i had to see it go so soon. So days i have to stay in bed and this is one of many favorites i love to watch when i do. Please keep Jane the Virgin on. Disabled Watcher. Same here, I love Jane the virgin please don’t end it at season 5. I just finished watching season four and im curious to see hat happens next. Will jane and Rafael stay together? Or will her and Michael get back together? And is that really Michael or does he have a twin too? And why did he fake his own death? I have so many questions!! Please don’t cancel it and when is season 5 coming out?